Until a few years ago, eating applesauce for me meant going to the store and getting a jar of applesauce. It’s one of those things that i never really gave a lot of thought until I came across a recipe for home made applesauce in Ina Garten’s Barefoot Contessa cookbook given to me by my cousin. It should go without saying that this is much better than store bought and it’s pretty painless to make, assuming you don’t cut or burn yourself. As with most recipes, I did it her way and then decided to change it up a little each subsequent time I made it and this is what we ended up with. 6 lbs apples with a mix of sour (we use Granny Smith) and sweet (we prefer Arkansas Black as in the picture but those are only available in the winter around here.) The ratio is up to you but ours skews towards the sweet side. Also worth noting is that while there are 5 Granny Smith and 7 Arkansas Black in the picture, the weight ratio is actually more like 2:1 so 4 lbs Arkansas Black to 2 lbs Granny Smith. Move a rack to the bottom third of the the oven and set the oven to bake at 350°. Peel, quarter, and core the apples saving the skin of two of the red apples. If you have one of those fancy apple corer things that cuts the apples into 8 pieces (we do not), use that. You will end up with a less chunky apple sauce but you will also work less. Juice the oranges and the lemon. Put the apples in the baking dish and arrange them so that they are contained and won’t spill out over the top of the dish. Spread the brown sugar over the apples sort of evenly. Pour over the orange/lemon juice trying (not too religiously) to spread it around. In other words, don’t just dump the whole thing in the middle. Cut the butter into 8 pieces and distribute them evenly on the top of the apples. Spread the saved red apple skins across the top with the skin side facing down. This adds color to the applesauce. Really. Cover the baking dish with aluminum foil, wrapping it over so that all the juice from the apples is trapped. Remove the baking dish from the oven, remove the foil, and allow to cool for about 5 minutes. CAREFULLY (it’s still probably hot enough that wearing the applesauce at this point would be undesirable) whisk the apples until you have achieved your desired consistency. 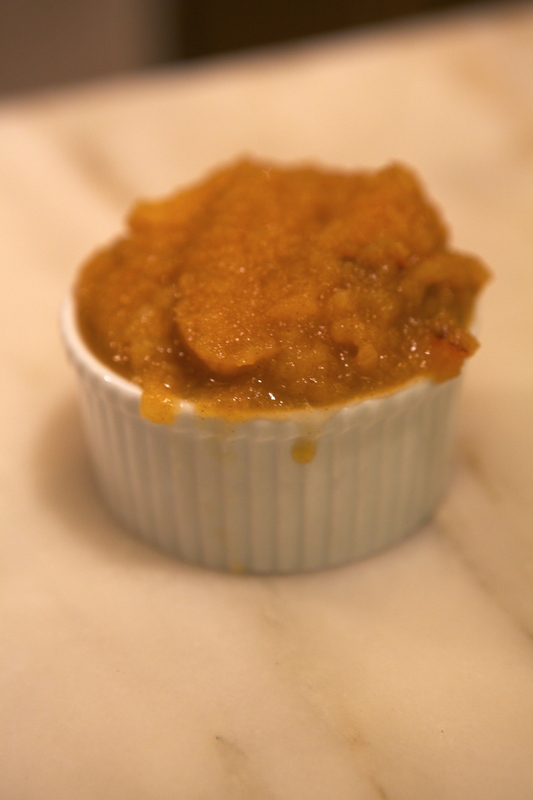 I leave a enough chunks to give the apple sauce a little texture. Allow the unconsumed portion to cool then transfer it to some kind of containers and put them in the refrigerator. I use leftover jelly jars that hold enough for a family of three (or one greedy dad) to have a treat. We normally end up with 4 jars left over depending on how much we don’t eat right off the bat.